I always felt some sort of connection to old movies or shows in which a confident hostess plans a chic and clever cocktail party, managing to mix, mingle, and sip away the night, while weaving her way between small conversations and while offering small bites. There was something about effortless DIY party planning that struck me, even at a very young age, and for years I’ve been drawn to books on hosting or entertaining. I can’t resist picking up, flipping through, and (nine-outta-10 times) buying one for my collection. And, they’ve been worthy purchases — I’ve gleaned some great ideas from each of them for dinner parties, holiday gatherings, game day events, and other occasions. But there are certain go-tos that I’ll refer to each time I plan to entertain. Some may seem a bit outdated, but they haven’t let me down yet. if you can find one, even at a used bookstore, grab it! A classic. 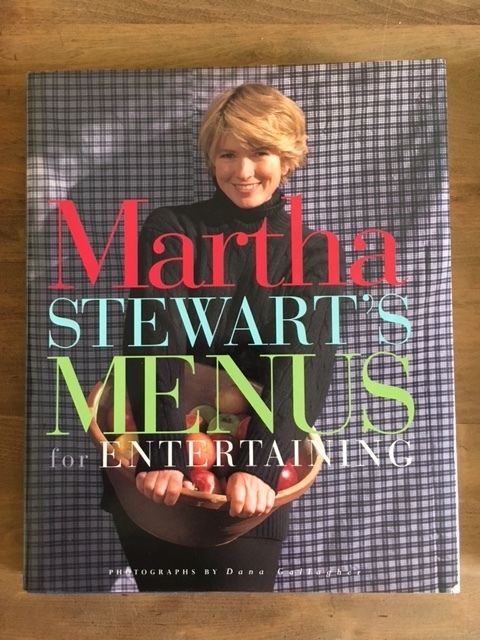 My mother and I would watch Martha’s show together throughout the ’90s, enthralled by seeing her craft designs, recipes, and parties come to life in short segments. Whether she guided you through an over-the-top Halloween theme or a simple summer shindig, Martha was magic. As always, she makes it seem so simple in this book (even when it’s not) and provides ideas beyond the typical. Menus include Hors D’oervres in the Garden, A Small but Special Baby Shower, Surprisingly Simple Chinese, Halloween’s Goulish Pleasures, Holiday Dessert Buffet, and more. A favorite: The Louisiana Seafood Feast offers a cajun-inspired menu ideal for a Mardi Gras celebration or a summer get-together, including: Cayenne Cornbread, Louisiana-style Shrimp, Spicy Crawfish, Thelma’s Coconut Cake, and others. How. To. Do. EVERYTHING. Which fork? What timeline? Budget bubbly? Alllll the basics and beyond are covered in this book. You’ll find 121 recipes, 313 ideas for effortless entertaining, and a whole lotta “I should’ve known that!” moments that will make you feel as though you have a Masters in entertaining. Sections include Cocktail Hour, Buffet, Dinner Party, Holidays, Outdoor Parties, and What to do when the party’s over. A favorite: The Setting the Scene section covers all of those little things you either haven’t thought of (What kind of salt should I serve? Should I put pepper on the table?) to those last-minute unexpected circumstances that could get awkward if you don’t know what to do (When a guest brings you cut flowers and you don’t have a vase, or how to make a ready-to-use kit for accidental spills). 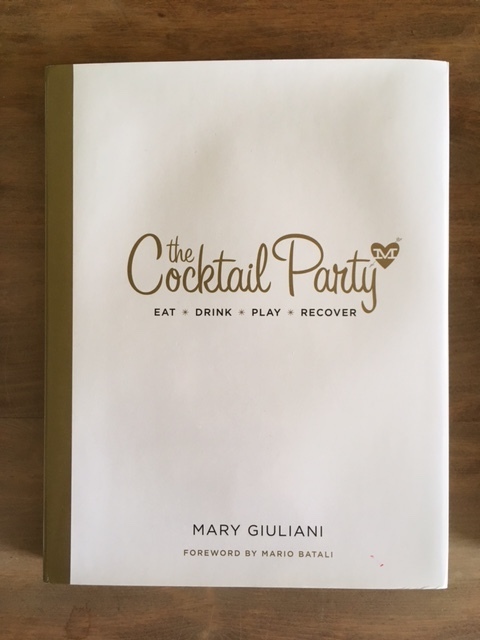 Sure, she’s a party planner to the stars, and that’s quite impressive, but really — I’m a sucker for anything Hudson Valley and there are references aplenty in this start-to-finish party book. Beyond the valuable tips for keeping your guests happy, yourself sane, and everyone as least-hungover as possible the next day, you’ll find witty writing with Italian flavor, stellar recipes for a slew of affairs, and fun illustrations by HV-based artist Jason O’Malley. Find ideas for New Year’s Eve, Awards Season, Surprise Party, Garden Party, Cinco de Mayo, and even small Weddings. A favorite: The Game Day section proves that a cocktail party can still be badass, and that a [insert sport] Party can be way more fun with the proper host(ess) and gourmet grub, such as: Mini Buffalo Chicken Grilled Cheese, MACO (Mac and Cheese Taco) with Guacamole, Banoffee Cream Pie in a Mug DIY Grilled Cheese Bar, and beer-infused cocktails Beerbon or Beergarita. So much fun! I bought this on clearance for less than $10 and have used it for inspiration often. 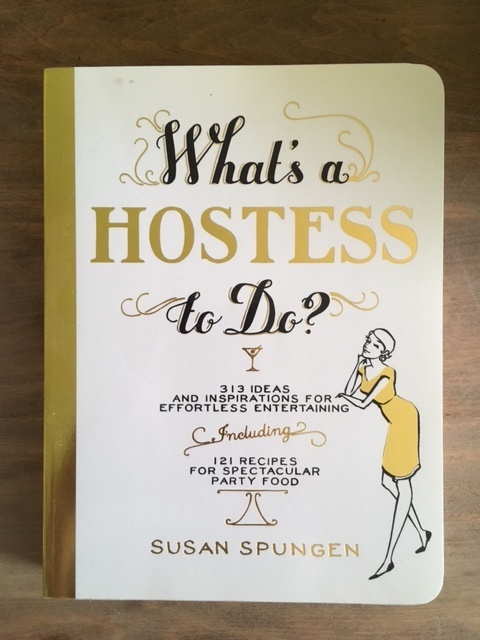 Although its subtitle is “the complete guide to easy, elegant entertaining” I find this is more of a low-key party book — best for guests who appreciate casual. 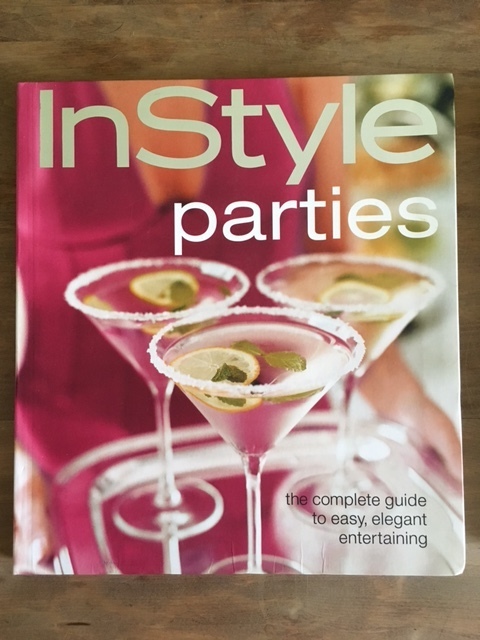 Created by the editors of InStyle magazine, the intro includes tips on invitations, stocking beverages, choosing the best wines and beer to pair with your meals, and timing, before offering guides crafted by celebrity party planners. Just a few of the many party ideas include: Early Autumn Supper, Thanksgiving Dinner, Super Bowl Party, Oscar Party, Afternoon Spa Party, and Backyard Luau. A favorite: The Mediterranean Dinner is a Greek-inspired summer meal featuring light dishes over three courses. The chapter offers tips on decor, music, and timeline building up to the day of your dinner party, and the menu includes a signature grape cocktail, mini dill-potato pancakes, grilled eggplant with feta and mint, bay-scented roasted chicken with retsina and dried figs, and sticky semolina cake with yogurt, figs, and honey for dessert.